This cute design includes a simple, sweet poem: Cardinals are red | Scrub-Jays are blue | Nothing is finer than | Birding with you. The poem is accompanied by a darling cartoon image of two birds in love. This is great for giving your romantic birding partner. 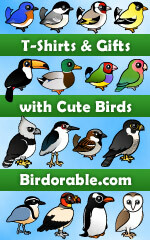 Love birding with your sweetie? Then this is for you both!